Will repost my question again since I believe it may have gotten deleted. Does anybody know how man portals you can make in the game? I've made the nether, Deep Dark, and mining portals so far. Any info would be much appreciated. it wasnt deleted you posted in on Space Astronomy page and now your posting it on Space Astronomy 2 page. Are there any official servers? If not, are there any that are known and good? Oa amigos gosto muito deste modpack poderia me tirar uma dvida? Porque os mods da thermal forao removidos? Se eu colocalos vai gerar algum conflito entre oa mod? Hi! I wonder if you could add vein mine and ProjectE to next update ore to astonomy 3? We already have a mod called "Ore excavation" that is better than vein miner, In Ore excavation you can configure it to fit your needs. You can change the sizes of the excavation with V.
Is there any way to disable any sound mods? The sound when you are crafting is driving me crazy and I don't want to shut off the maste volume ore any cind of that. And then it's the item collect/drop counter, can you disable it? 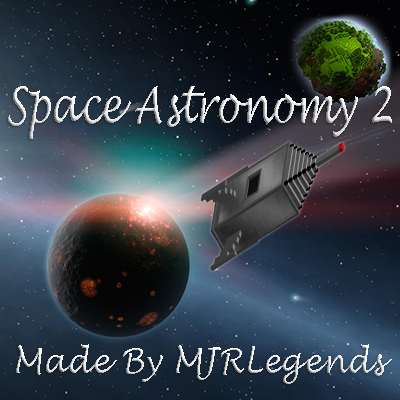 When will space astronomy 3 come out? and will it be for a newer version of MC?